My last post was that I was going to be a grandmother. I never would have dreamed that my latest design, “Baby Love”, would be published right after I found this out! Coincidence? Only God knows. 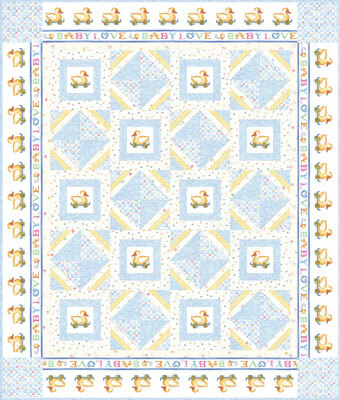 This quilt is in the May issue of The Quilter, and the kits (pink or blue) are available on my website. Below is what it looks like in blue. This fabric collection is by Susan Branch for RJR Fabrics. 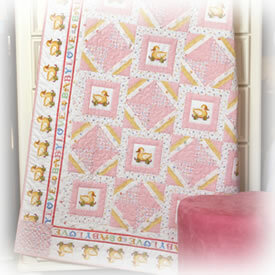 I love offering quilt kits in different colors as it is FUN to do! Not everyone can “see” a quilt in their head in different colors or fabrics. The blue is a virtual quilt that was created by my graphic designer, Staci, in CA. She is a whiz at scanning the fabric and digitally piecing the fabric together in Photoshop so it looks like a real quilt! If you look at a variety of quilt patterns and/or ads for quilts, you can tell if the quilt is a virtual or a real quilt. Check out the borders and see how perfectly straight the borders are. It’s a great way to show new fabric collections to you, the consumer, before the fabric hits your fabric store; and while it’s being printed, too. Oh, what amazing technology we know have at our fingertips! It’s the end of February so it’s still SOUP TIME here at the Crawford home. Here is one of our family’s favorites that is quick and easy to make. Enjoy! 1. In a large saucepan over medium heat, brown the ground beef and onion; drain. 2. Add remaining ingredients. Bring to a boil. Reduce heat; simmer 15 – 20 minutes or until the rotini and vegetables are tender. 3. If desired, sprinkle Parmesan cheese on top before serving. Makes ten 1 1/4 cup servings. Now back to finishing the “Flutterby” quilt for the July issue of The Quilter…..
A note from my husband, Tom who wants you to know that when you purchase quilt kits and patterns from Flower Box Quilts that you are supporting a small home based “Made in America” business, and we appreciate your business very much!